This event ran from the evening of Friday 24 October with a dinner for all delegates with an all-day event on Saturday 25 October. The dinner was to celebrate the first event of the Creativity Group and included a series of activities both before and after the meal. The PCE explored the way creativity can act as a catalyst for fundamental change in education. In particular, we focused on the way creativity in English Language Teaching can help to bring about change in society through English Language Teaching. This involves moving away from a limited view of ‘creativity as fun and games’ to ‘creativity as empowerment, spontaneity, and social action’. A central issue we addressed was how we as teachers are agents of change, and how we can instill a sense of responsibility and build a shared vision of a more just, humane and sustainable future. As educational critic John Holt writes, true leaders do not make people into followers, but into leaders. This one-day event gave us the opportunity to reflect on what such leadership looks like in the ELT classroom. The day was a mix of TED type talks and Open Space participant-driven activities. With the short talks our aim was to spark ideas, focus attention on different aspects of creativity and change. Open Space then made it possible for all of us to participate in in-depth, spontaneous discussions and arrived at some new insights. The day offered participants a series of talks and workshops on how to explore films with English language learners. The presenters shared ideas on how films can be used both inside and outside the classroom to promote language awareness, critical thinking and the development of the four skills as well as tools for the fostering learner autonomy and independent learning skills. This was a joint event with the Creativity Group (C Group). Talks and workshops were delivered by experienced teachers, renowned ELT teacher trainers, and experts in the field of Film Studies. 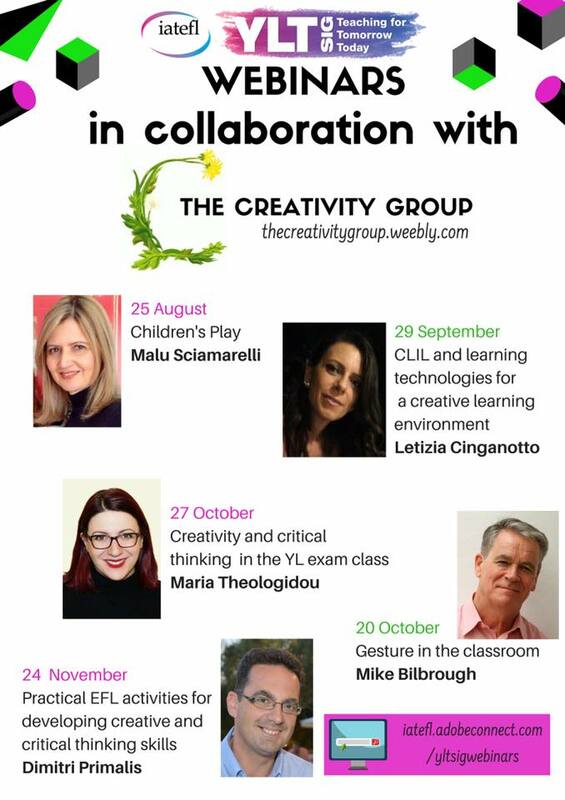 The C Group will be collaborating with the IATEFL Young Learners and Teenagers SIG over the next few months to bring you an excellent webinar series. I was invited to participate in the International Conference on Inclusive and Equitable Quality Education in ELT, held on 26/27 October 2018 at the SSN Engineering College just outside Chennai in South India – and co-sponsored by Anna University. Numbers were not large – approximately 100. But geographical and professional coverage was extensive, with participants coming from as far away as Assam, and including teachers from the prestigious English and Foreign Languages University in Hyderabad (EFLU). So there was quality participation and good outreach. Part of the spin-off was an invitation to give a plenary at the Jubilee Conference of ELTAI (English Language Teachers Association of India) in Delhi next October. 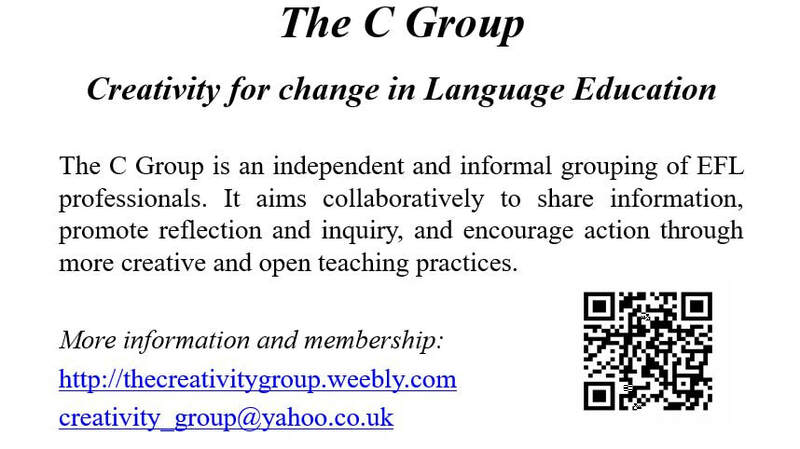 I was able to give a plug for the C Group which may help to boost memberships. For this I used a slide designed by Malu Sciamarelli (see below). I would suggest that we all include this slide in our presentations from now on.